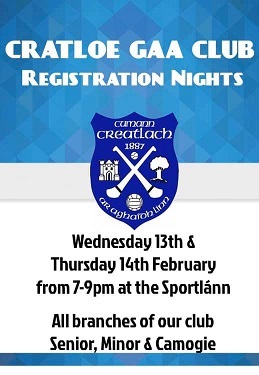 We will be holding our club registration nights for 2019 membership next Wednesday 13th and Thursday 14th February from 7-9pm at Cratloe GAA Club. Registrars from the minor, senior and camogie clubs will all be in attendance to assist all members from U6 to infinity. Please ensure you are signed up before activities recommence to safeguard yourself and the club in case of injury. We ask that all players and members read and familiarise yourselves with our recently updated and adopted Code of Behaviour, which can be viewed across our social media platforms and at the Club house.